Heat 35 g of butter with milk until the butter is melted. Mix 300 g flour with salt, make a well in the centre. Add the yeast, 20 g sugar and few spoons of warm milk. Mix a little bit and leave for 10 mins until the mixture comes foamy. Add egg and more warm milk mixture. Stir to mix all the ingredients together. Then knead on a working surface dusted with the flour for about 5 mins until tight and smooth. Add more flour if needed. Let rise for about an hour. Mix the curd with 40 g sugar and raisins. Melt 5 tbsp butter and add the rum. Spread the large baking pan with the butter. Roll out the dough on a slightly floured surface until 0.5mm thick. Cut squares large approximately 7.5 x 7.5 cm. Spoon the curd filling on the centre of every square. Wrap them into balls and make sure the filling is not running out. Place the buns into a pan, seam-side down. 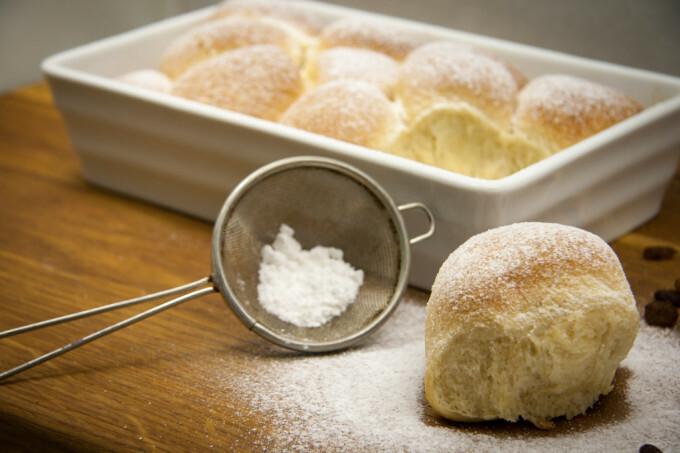 Butter the sides and top of every buns to make them separable after baking. Let the buns rise for 20 mins. Immediately smear with more melted butter. Let it cool. Raisins can be also steeped in a rum to make them soft and juicy. It takes at least 1-2 hours.